Pre-war Vauxhall car agency in England, 1939. Homepage. This page: Hailing from the late 1930s, an invoice from motor engineer & Vauxhall agents W. Wilson. W.Wilson - pre-war motor engineer. 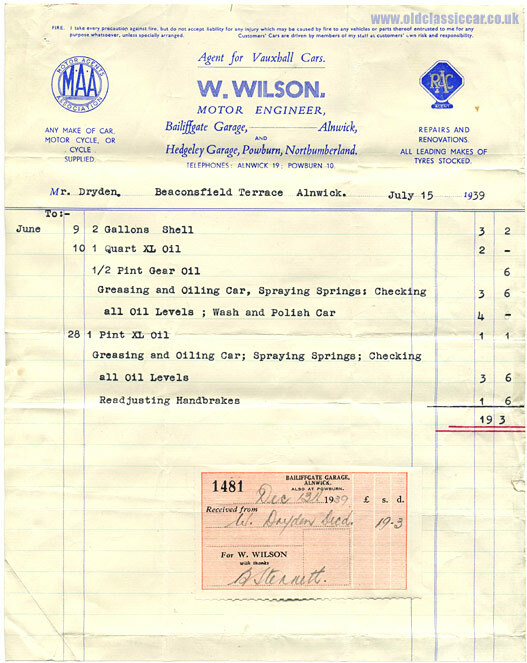 W.Wilson, motor engineer and agent for Vauxhall cars in the 1930s, occupied two premises in 1939 according to the information presented on this pre-war invoice. The first was Bailiffgate Garage in Alnwick, the second being Hedgeley Garage, in Powburn, Northumberland. The firm was a member of the M.A.A. (Motor Agents Association) and was also an approved RAC agency. In addition to servicing work, and the sale of new Vauxhall cars, they were also able to supply all the leading makes of motor-car tyre, in addition to cars of other manufacture, motor-cycles and bicycles. This invoice, dating to July 15th 1939, was sent to a Mr Dryden of Alnwick, for servicing work he'd had done to his car in June. This included two gallons of Shell motor spirit, various oils, and service items such as greasing the car's chassis, and giving it a wash and polish. Alas no mention of the car receiving the attentions of this work is mentioned. While the invoice is dated July 15th, the receipt for payment (nineteen shillings and threepence) is dated December 13th 1939, almost five months later. Bailiffgate Garage appears to be no more, although Hedgeley Garage in Powburn, or a business of that name, is still in existence. Beaconsfield Terrace, the address of customer Mr Dryden, is also with us still. A check of pre- and post-war copies of the RAC Handbook (1928/29 and 1949/50) includes no mention of Bailiffgate Garage in Alnwick, but does contain a reference to W. Wilson's Powburn address, albeit (in the 1949/50 copy) with the Alnwick 19 telephone number rather than the Powburn 10 number, both of which are shown on the invoice above. Perhaps only the garage in Powburn was RAC approved? By the time of the 1959 RAC Handbook, the Hedgeley Garage is still listed in Powburn, albeit now in the ownership of N. Pringle & Co. Ltd.
A similar pre-war Vauxhall agency invoice, dating to 1940, can be found on the Greenfield Garage (Vauxhall) page.